Women in post-war America enjoyed increasing influence as consumers, including amongst auto manufacturers. General Motors trotted out several concept cars aimed at women, but it was Dodge who first offered a real-world choice in the form of the 1955 La Femme, based on its Custom Royal Lancer hardtop. 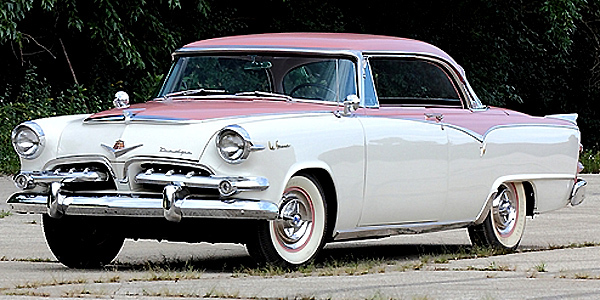 One of only 1,500 sold in 1955, this La Femme sports that model’s exclusive Heather Rose and Sapphire White paint, here trimmed with chromed front and rear bumpers, stainless steel rear gravel guards and drip moldings, dual outside mirrors and full-size wheel covers over wide Whitewall tires. The feminine touch prevails inside, where “Cordagrain” Rose-patterned cloth upholstery is accompanied by full factory instruments, an Airtemp heater/defroster unit, a courtesy lamp package and a Town and Country push button AM radio with FM conversion and trunk-mounted CD player. While clearly a “woman-only” automobile, muscle was also standard equipment in the La Femme, which was powered by Dodge’s 270 CI 4-barrel, dual-exhaust Red Ram Hemi V-8 augmented with a Powerflyte automatic transmission and power steering. This low-production special, produced only in 1955 and 1956, is the rare product of a pioneering period in automotive niche marketing.